Announcing a new Meetup for Homeschool Village! I will post each one as a separate event, but wanted to give you a heads up now. Just a side note: In the past, we have attended the Hoffman Estates homeschool open skate and found it beneficial to wear snow pants. Hope to see many of you there! Please let me know how many will be attending and what size skate you will need so they can be fully prepared for us the day of this event. The Homeschool Legal Defense Association has a companion organization that comes along side homeschool families during crises and times of unusual financial need. These families might be faced with that unfathomable decision: to provide for the basic needs of their family members, or to continue homeschooling. The Home School Foundation seeks to help families to meet their financial needs and still continue homeschooling. Right now, HSLDA is using art work from last year’s art contest as a fundraiser for the Home School Foundation. The young artists have donated their work for an auction with the proceeds going to benefit home school families in need. Contributions to the Homeschool Foundation for the artwork are tax deductible and will go to support the Special Needs fund. The auctions end on December 31st, 2009 at 5pm EST. I would encourage you to take some time to view the pieces available for auction, you just might find one that would look great on your living room or home school room wall, and in the process help a home school family in need. Details: An online subscription to a site featuring math competitions and teaching. Price: Right now this is $59 per year per child. And, knowing the Human Calculator’s favorite number is 9 should get you an additional discount. While I didn’t know that we really needed another math product floating around the house, I quickly learned that Mathletics was not just another math product. This became a common site on our computer screens, as my kids raced against kids from around the world in real time. But, the real competition was against their previous scores. The rewards poured in as my kids’ math abilities continued to thrive in this lightly competitive and highly rewarding environment. In addition to the speed drill type races against other kids they also boosted their math skills. 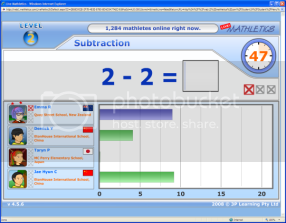 Mathletics offers nine levels of math teaching and practice, from kindergarten through eighth grade. Students learn about various topics and again receive recognition for increasing their math knowledge. I was surprised to see my kids highly motivated by the characters they chose and getting to “buy” new hairstyles, backgrounds, etc. as they completed more problems correctly. Friendly competition. While the drills take place against other students, you really compete against your own best times. You receive rewards as you improve your personal score. International involvement. My kids loved seeing what countries popped up in the races. New Zealand, UK, Canada, Australia, Puerto Rico, UAE, etc. Many levels of material. Topics cover mathematical concepts from kindergarten through eighth grade. It is not just speed drill material. A couple times now, in our “regular” math time, my daughter has said, “Oh yeah, I learned that already on the computer.” It is definitely more than just playing games, but the kids don’t need to know that. Lots of recognition of achievement. Students receive points for topics mastered and improved skills, and printable certificates are available as well. Not a complete curriculum. While Mathletics offers a great supplement to math and definitely presents the material in an interesting and engaging format, it does not offer a thorough math teaching for each level. They seem to present it as a curriculum, but I do not feel it is as thorough as most texts we have used. A little pricey if you have multiple children. While in general the price is reasonable, it adds up quickly with many school aged children. Parents should check in on their student now and then. You will want to take some time now and then to see what they have worked on, how much time they spend on various topics and activities and check up on them. While the student can easily work independently, you will want to stay involved to make sure they make the most of the time online. Mathletics is another great math resource. It definitely kept my kids’ interest throughout the time that we had the subscription and they were sorry to see it end. It offers entertainment and motivation for a student to learn and practice their math skills even outside of the regular school day. Disclaimer: This web membership was provided to me free of charge from Mathletics as part of my participation in The Old Schoolhouse Homeschool Crew. I received no additional compensation and the opinions expressed here come from my personal experiences and sincere thoughts. Programming seems a difficult task for the untrained, and generally that holds true. However, Tektoma offers web based tutorials to help interested individuals get started in creating their very own computer games. On the Tektoma website, the creators Tom Marx and Matilda O’Connor have built a place for budding video game designers. Using GameMaker software, a free download, they have put together a number of tutorials to help you understand this somewhat complex program. GameMaker “allows you to make exciting computer games, without the need to write a single line of code. Using easy to learn drag-and-drop actions, you can create professional looking games within very little time.” They make it sound easy, but without the tutorials on Tektoma I could not begin to create a game on my own. I know nothing of rooms and sprites and sound effects. But, with Tektoma, you don’t need to know anything to get started. Price: Monthly membership is just $14.95 per month. Or, you can join for a whole year for $140. They have a free 14 day trial for a limited time that can help you see if Tektoma is really what you are looking for. Easy to follow. Although my 12 year old son jumped into this easily, I was a little more uncertain. But, after a little time watching the videos, I realized that even I could use this program and have fun doing so. Very well made. Clear visuals and sound. They really covered the bases. Step by step, everything you need to do shown clearly. They even have a video on how to use the videos. They do move a little fast at times, which is good when you kind of know what you are doing, and it is easy enough to pause or back up a bit if you missed something. Great introduction to programming even if you have no knowledge. The videos don’t just show you what to do, they explain what you are learning as well. With enough use and interest you could easily become independent of the tutorials, at least until you move on to the next type of game. They plan to continue to add to the website, so even if you made it through all of the tutorials that they have, you will likely find more on their site to continue to expand your knowledge and ability. You can share your games with others. Once you have created your own game, you can post it to their site for others to see. They help you create a variety of games. Racing games, memory games, and arcade games are geared specially toward beginners. Then you can move on to platform and fantasy or adventure games. Always a downside . . .
Make sure you check out the system requirements (Currently, the tutorials are for computers running Windows XP or Vista only. Macintosh versions coming in the future. Broadband internet connection also required). I found the GameMaker software complicated, but that’s why they made the website. In one of the tutorials they say something to the effect of, “Even if this does not make sense to you now, just keep following along and doing exactly what I do and you will begin to understand.” VERY true. I had no idea what all the numbers and labels and tabs meant, but after mimicking his actions in the video, I began to understand what I was doing. Although this says it is geared toward kids between seven and seventeen, adults would definitely enjoy this product as well if they have any desire to begin learning how to create computer games. I also think the prime audience would be 10-14 year olds who would be old enough to do it independently, but not ready to conquer real programming. My 12 year old son really enjoyed using this and created quite a few different types of games with it, with no help from me (not that I could have been any help at that point). Of course, right now they have that 14 day free trial so you can give it a test drive and see what you think. This might make a great Christmas gift for a computer inclined pre-teen or teenager (or adult . . .) If you would like to find out more about subscribing to Tektoma you can follow this link. Disclaimer: This web membership was provided to me free of charge from Tektoma as part of my participation in The Old Schoolhouse Homeschool Crew. I received no additional compensation and the opinions expressed here come from my personal experiences and sincere thoughts. Not words you hear too often. Not words I recall hearing in our house until we started using All About Spelling after receiving it through the TOS Crew to review. The perfect spelling curriculum for a variety of learning styles, from the beginner through middle school, students needing remedial spelling help (or phonics review — this was great for my third grade daughter), or parents seeking a solid curriculum geared specifically toward the homeschool environment. Details: A multi-sensory, logical, gap-free, mastery based, review-filled, and easy to use spelling curriculum for preschool through middle school. This curriculum is clearly designed with the homeschooler in mind. Not some rewrite of a classroom program. 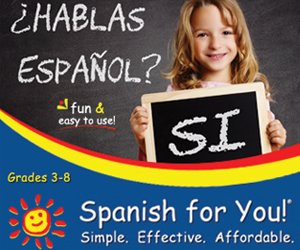 Scripted lessons geared toward a one-on-one interaction with your child. Very hands on. Lots to look at and touch to keep the learning interesting and keep the student engaged. It works! My third grader has had a few glitches in her reading. We’d resolved most of the issues, but I hadn’t been able to nail down one or two last areas that she was missing because she has a tendency to read whole words (despite her phonics upbringing) 🙂 This program has helped her slow down and helped us both identify and solve these remaining problem areas, already making a huge difference. I know it’s not plugged as a reading program, but it ended up working that way for us. Based on ability not grade level. We know that kids don’t often fit the mold they “should.” All About Spelling presents spelling in a progressive format, but not restricting it to grade level classification. While Level 1 had lots of easy material for my third grader, it ended up being a great place to start her off to make sure that we didn’t miss anything. Easy to use. A quick glance through the lesson and all the materials on hand and we can quickly jump right into the lesson. Comes with just about everything that you need. With the starter pack and Level 1 (and we also received Level 2 which we have just begun to work with) you have everything you need. Letter tiles, magnets, CD, Phonogram cards, sound cards, key cards (with rules to learn along the way), and the spelling word cards. You do also need a magnet board, a file box for the cards, and possibly a dry erase board or chalkboard for spelling practice. But, the downside . . . Yes, this is a little expensive for “just” a spelling curriculum. However, most of the material can easily be used for later children with little or no additional purchase depending on your methods and preferences. And, I really felt like it reached into far more than just spelling. If I did not know how much we would love this product the price would turn me off, but in my opinion, it is definitely worth it. It does take a little time to set up at first. Cards need to be torn along perforated lines (LOTS of cards), letter tiles need to be cut apart, and magnets affixed to the backs of them. With some extra hands this isn’t a huge project, but it does take some prep before the first lesson. Others have done it, but I had a hard time working through two students in the same level at the same time. Trying to keep their cards straight did not work well for me. I kept forgetting and putting them back in the wrong divider, or reviewing the wrong set with each child. So, since my younger daughter is just in kindergarten, and my third grader is moving pretty quickly, I am just waiting until she is done with level one at least to begin my younger daughter. We really love All About Spelling. I am pleased with the quality of the product, the ease of use, and the excellent academic standard. If you think it might be for you, I would encourage you to visit their website. They have a free download with 20 spelling tips that everyone can take advantage of on their home page. You can also view their FAQ page and their advice on what level to order for your child(ren). I definitely highly recommend this product. Disclaimer: This spelling curriculum was provided to me free of charge from All About Spelling as part of my participation in The Old Schoolhouse Homeschool Crew. I received no additional compensation and the opinions expressed here come from my personal experiences and sincere thoughts. Last week we enjoyed a fun outing with my parents to Fullersburg Nature Center. We ended up there during a preschool story time, in which my kids made up most of the audience, but they learned some new information about beavers and other animals native to that preserve. The nature center has a variety of animals for viewing, stuffed and living, a partial woolly mammoth skeleton from nearby Blackwell, puppets and books, loads of information on the creatures of the area, and lots that kids can get their hands on. A popular display had about a 2 1/2 foot square wooden box with silly putty type substance covering the bottom. Stored along the sides the kids could find prints of various animal tracks that they could then press into the putty to make their own animal tracks. Cards hanging next to the display helped them figure out which animal they had and a bit about the animal as well. My kids also enjoyed the giant bird nest they could climb into and pretend to welcome mama bird home. Puppets and books help create a fun environment for kids in the cozy nest. My mom brought a simple craft project that also involved animals and fine motor skills — weaving. She always has surprises tucked away, like this one from Oriental Trading Company, for times like that. Simple, and yet it tied in nicely with all they saw and learned that day. After some time inside, we headed down the trail to the Graue Mill. Although closed for winter, we had a quick walk around outside and watched the ducks in Salt Creek nearby. It will not open again until mid-April. You can get those Museum Adventure passes for some free admission at that time. Even as the winter weather sets in, as long as you dress for it, a hike outdoors can do wonders for bringing a special refreshment to your day, and you never know what you might spy along the way. Be sure to check out the detailed Field Trip listing on our site when you search for more ideas to add some sparkle to your school day. Got enough books to open a small library? Finding you could probably do without a few? Looking for a good home for some of your excess books? The military is actually looking for a few good books. Find out more about this program at the Books for Soldiers website. Try to keep your package the size of a shoe box or similar. When we send out a box, we use FLAT RATE BOXES that the US Postal Service offers. It is a very good deal – you can cram as much as you can in the box and shipping is a flat $8.10. Also, the boxes are FREE from the US Post Office. Large packages over 25 pounds probably will not get through or be greatly delayed. Include a note to the recipient. Tell them about your support of them and your hopes of a safe return. If you are sending to the unit in general, explain that these books are a gift to the whole unit and to give them to someone else once they are finished. It is also good to send a small care package of useful items along with your book. Click here for a recommended list. Include your return address. Packages with no valid return address will be considered a suspicious package and likely to be destroyed according to the Defense Department. Any book is better than nothing, but if you have the choice, please send the paperback version because it is smaller, lighter, and easier to carry. Obviously, they want mostly books geared toward adults, not children, but since most homeschoolers are bookaholics all around, you probably have your share of those to spare as well. There is a bit of a process to go through to actually send your books, but if you want to encourage a soldier this holiday season, a little effort on your part could go a long way. Please join us for the ICHE Ladies’ Midwinter Renewal on January 16, 2010. The day will be one to look to the Lord. He has promised to refresh and to satisfy you. You will be so blessed by all that is being planned. Marilyn Boyer is our dear guest speaker. Marilyn delights in raising and teaching her 14 children to walk in the ways of the Lord, and she is looking forward to spending the day with you. A well-known conference speaker and author, Marilyn brings with her over 30 years of home educating experience. Her sessions will include the following titles: Pushing the Reset Button, Holding Their Hearts, and Learning to Delight in Your Children. This event will be held at Christ Church of Oakbrook located at 501 Oakbrook Road, Oakbrook, Illinois 60523. The doors will open at 8:30 a.m., and the conference will be from 9:00 a.m. – 4:30 p.m. The cost is $35.00 per person. This includes a delicious luncheon. Beautiful gift certificates are available for husbands to purchase for their wives, or you can purchase one for a friend. Registration information is available at www.iche.org under events. You’ll be so encouraged and refreshed with the sessions, the worship of our Lord, and the fellowship with like-minded ladies. Come and join us. You’ll be so glad you did! Sign up now at www.iche.org under events. The registration deadline is January 8, 2010. A great way for kids to get some exercise and exposure to team sports is a local gym and swim class. Park Districts have started offering these during the school day, geared just for homeschoolers. If yours does not already do so, you might want to contact them and see if they would consider it. Many places are glad to put their staff and facilities to good use during some of their regular off hours, for a reasonable price. It’s time to register for the Elk Grove Park District homeschool swimming lessons and art classes. Classes begin January 4th and go through February 25th (8 weeks). Swim lessons are $48 per student and art classes are $57 per student. Various classes for kids from 3-12 years old. Please note that participants must be registered at least one week prior to the start of the class to ensure that the class has enough children to meet the minimum requirements. Classes may be canceled due to low enrollment. Registration is on a first-come-first-serve basis and the registration office will contact you in case of a wait list. Meeting on Tuesday, Wednesday or Thursday from 1-3 at The Centre of Elgin, 100 Symphony Way. Fees are $54 for residents and $64 for non-residents. They tend to be quite flexible with partial enrollments as well.